Discover Cali's history and culture by eating and drinking at colorful markets, observing colonial architecture, and, most importantly, dancing salsa with our insider Jacqui's 24h itinerary. 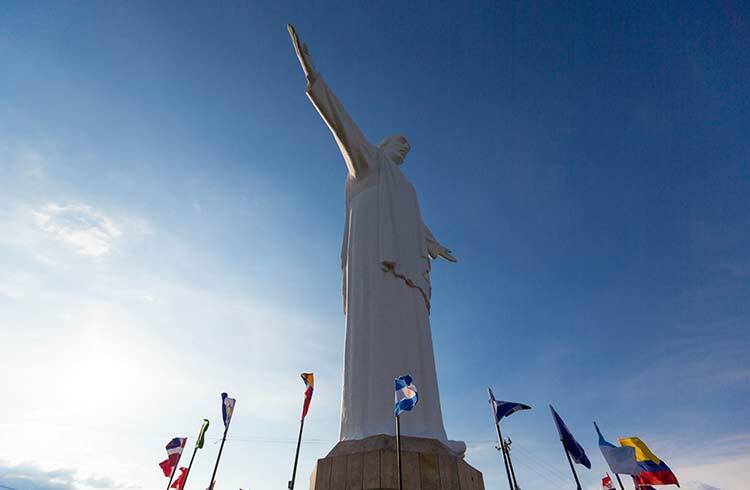 Start the day at the 21m (69 ft) tall statue of Cristo Rey that sits high up on the mountain, overlooking the city. Buy some local snacks and enjoy the stunning view here. The romantic nature of the spot makes it’s a favorite for couples, especially in the evening. Walking up is possible – but don’t do it alone, at night, or carrying valuables – It’s best to take a taxi here. Next stop is Cali’s crazy, colorful outdoor market, Galería Alameda to get a sense of the city’s true vibe. The market sells everything from weird-looking exotic fruit, vegetables, and flowers, to bizarre meat cuts, love potions, and tons of food stalls. One specialty here is seafood, so why not try ceviche— raw fish or shrimp marinated in a tomato sauce or tangy lime. Do try one or two chontaduros (with salt and/or honey for extra flavor)—the fastest-selling fruit due its believed libido effects – or a refreshing lulada made with lulo and lime juice, or a traditional corn-pineapple-lulo-cinnamon champus. Pick up some artisanal souvenirs at La Caleñita, just outside the market. Hop in a taxi and go north less than 3km (2 miles) to Museo La Tertulia, Cali’s most popular art museum. The museum also hosts La Cinemateca movie theatre, which shows weekly international independent films. Walk to the wide avenue that runs parallel to the river and head to El Parque del Gato de Tejada. Take a selfie with El Gato del Rio—a large sculpture of a cat donated by Colombian artist Hernando Tejada in 1996. Since then, several other cat sculptures have been installed, each created by a different artist. From Cat park, walk along the river on the shady boulevard towards the center. Talk a stroll through Plaza de los Poetas and share some heartfelt rhymes with the statues of poets on display. Admire the stunning Iglesia Ermita; a 20th-century church boasting European gothic-style architecture which contradicts the surrounding modern-day buildings. Now’s a good time to slurp up a cholao – a sweet mix of crushed ice, fruit, condensed milk, and flavored syrups, or a pandebono—a delicious baked corn flour, yucca, and cheese bun. Pause for a moment on a bench in the palm-filled Plaza de Cayzedo, Cali’s main plaza—another great place for street food. Bordering the plaza are several impressive national monuments: the neoclassical-designed San Pedro Cathedral and Palacio Nacional, and the Republication-style Edificio Otero. Although the center is pretty safe, don’t walk south or east from here as the streets become very dodgy in the Sucre and El Calvario neighborhoods. Walk west 1km (0.6 miles) or take a taxi to the historic hillside neighborhood, San Antonio. Considered as Cali’s bohemian quarter, this is a great place for drinking coffee and people watching. In the past, this colorful neighborhood was home to several Colombian writers, artists, philosophers, and musicians. Walk up to the San Antonio Church, built in 1747, for a great view of the city. End the busy day with a drink at any of the little bars. For a more party vibe, cab it to the suburb of Granada, a popular nighttime hangout and one of Cali’s best gastro-zones. Cali wears the title ‘world capital of salsa’ with aplomb. Traditional bars brim with passionate locals whose blood pulsates salsa rhythms. Get ready to fall in love. Dance in the ‘salsa capital of the world’, attend one of these festivals, explore San Antonio, and see Cali's best monuments. Colombia offers everything from cheesy tourist trap accommodations to high-class personalized splendor galore. Wherever you go, there are abundant options for places to stay. Except for the places that are still off the beaten path.